David Benjamin and his firm The Living are designing new materials at the intersection of synthetic biology, architecture, and computation. 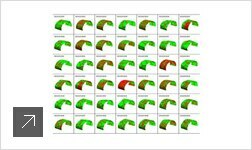 These materials offer insight into the near future when synthetic biology may play a role in designing and manufacturing the built environment for higher performance and lower environmental impact. 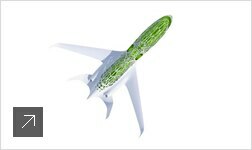 The Airbus concept plane embodies what air transport could look like in 2050. Ultra-long and slim wings, semi-embedded engines, a U-shaped tail, and lightweight body all help to improve environmental performance. 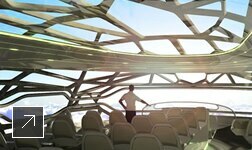 This Airbus plane is only a concept, but it stretches the imagination of engineers. Through a combination of naturally occurring features, bacteria factories are created for manufacturing building materials. This process is then modeled in a software workflow. Designers can explore thousands of options by varying the properties of bacteria, which translates into different patterns and behaviors in the materials. 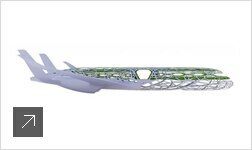 Future aircraft could be built using a bionic structure that mimics the bone structure of birds. 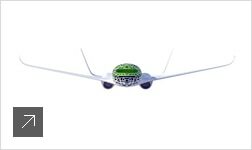 This would not only reduce the aircraft’s weight and fuel burn, but also would enable features like panoramic views. 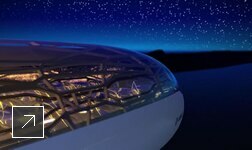 The cabin would be coated with a biopolymer membrane, which would control natural light, humidity, and temperature, providing opacity or transparency on command and eliminating the need for windows.